Review date: 13 July 2001. There ain't nothing like waking up to the smell of a dead computer. It's a distinctive smell. I've smelled it before. 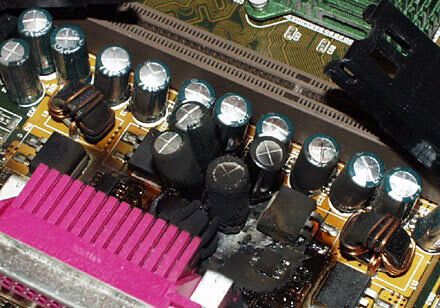 And it gets all over the place, when a computer dies in such a way that the exploded electrolytic capacitors and burned-off phenolic resin that make up that smell get their unmistakable aroma blown out of the back of the box by the power supply fan, before everything becomes still and quiet. Everything is not still and quiet in either of my Rooms Full Of PCs, so it took me a moment to find the one whose power light wasn't on any more - and which didn't respond to its power button. Every component in this particular machine had been running pretty much non-stop since I got it. At the core of the machine was one Abit KA7-100 and one 700MHz Slot A Thunderbird Athlon (Actually, an overclocked 500MHz one). Well, so much for them. One year of non-stop service led to one smoking ruin. 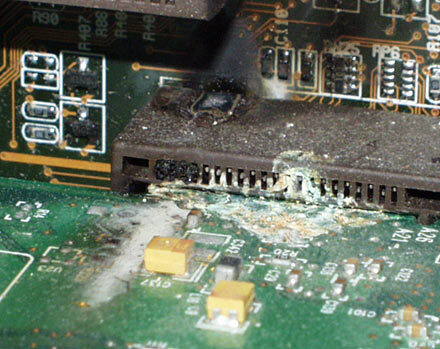 The CPU looked fine, but behind the CPU socket was this nasty crusty mess. 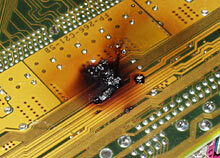 The motherboard felt the burn all the way through to the other side. Since the CPU seemed to be OK, I yanked the older 500MHz Athlon out of my elderly Asus K7M machine and swapped in the faster processor. That wasn't smart, was it? 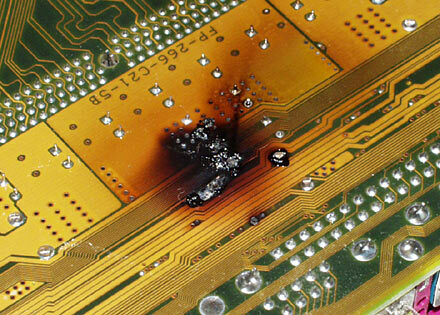 One small flame from the AGP slot later, I'd successfully executed both the K7M and my poor old Viper V770 TNT2 card with it. Pausing only to put a Post-It note on the CPU Of Doom that reminded me never to plug it into anything I wanted to keep (I should probably sell it on Ebay...), I decided to see how quickly I could get at least one of these machines back on its feet. I wasn't going to be able to find a new Slot A motherboard easily (the 500MHz CPU has already found a new home elsewhere), but I had a spare AJFA 1GHz Socket A Athlon kicking around after my most recent dalliances with the overclock-happy AXIA and AYHJA-code versions of the chip. All I needed was a motherboard to put it on. The computer I wanted to rebuild is my Win98 test box - the one I use when I want to see how something works on 98, without getting out of my seat. It doesn't need 3D power, positional audio, a RAID array or a satellite dish; it just needs to work. So I grabbed myself a new all-in-one board. Just looking at the spec sheet, this looks like a great Socket A board for the undemanding user. It uses the Via KL133 chipset, and it's got built in sound and video. Some versions of the board have built-in networking as well, but the one I got doesn't. 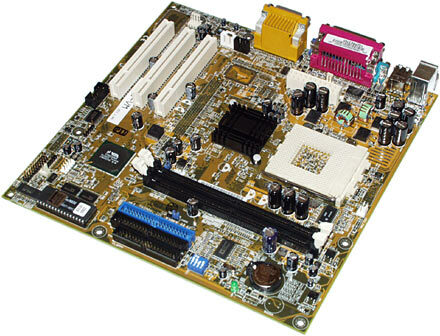 The A7VL-VM uses the microATX form factor, so you only get three PCI slots. But there's so much stuff built in that you're not likely to need more than that. And the small form factor means the board will fit in a teeny-tiny case. At $AU236.50 delivered from Aus PC Market (Australian shoppers can go there by clicking right here), the A7VL-VM would seem to be rather good value. Its only serious limitation is that it only supports 100MHz FSB CPUs. You can use 133MHz RAM, and you can goose the FSB up to 110MHz if you want, but if you just drop an Athlon made for a 133MHz FSB into the A7VL-VM, it'll run at three-quarter speed. Bear in mind that a 1GHz 100MHz FSB Athlon, delivered with a CPU cooler, can be had for a lousy $AU269.50. A 900MHz Duron's not a great deal slower, and it'll cost you less than $AU200. 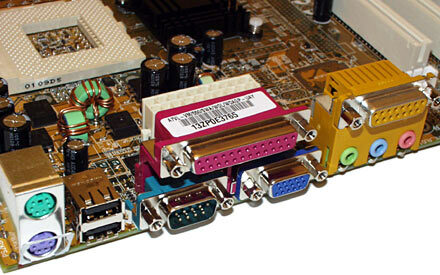 With an all-in-one, you don't need to buy a video card and you don't need to buy a sound card. And 256Mb of quality PC133 SDRAM will now only set you back $AU110.00, delivered. There's the core of your computer, right there, and you can get going for less than $AU550. 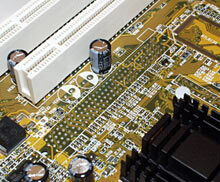 If you poke around the Via site, you won't find the KL133 chipset mentioned. That's because it's basically a KM133, with one difference. Here's the difference. It's a KL133 board if you don't get an AGP connector - this collection of blank solder pads on the A7VL-VM are where the AGP slot should be. You're stuck with the built-in S3 "ProSavage" video hardware, unless you want to disable it and use a PCI video card. On the back of the A7VL-VM, there's the usual all-in-one connector cluster. Keyboard, USB, serial, parallel and video, audio and joystick. The video connector sits where one serial port would normally be; if you need that port, you can still use it, because the motherboard comes with a header and cable-and-backplate package that allows you to put the serial port on any rear panel slot. Or screw it into the hole often provided for the purpose on the back of ATX cases. Setting up the A7VL-based machine was straightforward enough; I gave it a network card and 128Mb of RAM, installed Win98, and everything proceeded normally. The video adapter thieves 16Mb of system memory for its own use, but a 128Mb Win98 machine, even chopped down to 112Mb, works well enough. Install the included Via 4-in-1 driver pack and the video and sound drivers, and you're away. It was around this point, though, that I discovered something nasty about the A7VL. How long does it take to copy a 1Mb file over a plain vanilla 100BaseT Windows Local Area Network, would you say? A second or two, right? And most of that time's just you waiting for Windows to draw the icon for the freshly arrived file. Unless there's a ton of network traffic, files should transfer over a network like this at an easy five megabytes per second. Probably more. On the A7VL-VM machine, a 1.1Mb file took 45 seconds to copy from another machine. When the file finally turned up, it was just fine, mind you. No data corruption, no error messages. And there are no latency issues to speak of - look at Network Neighborhood and you're not sitting there for five minutes watching a waving flashlight. It's just mind-meltingly, gob-smackingly, astoundingly slow to actually move any data. Oddly, copying files from the A7VL machine to others worked at normal speed. I reinstalled drivers, I changed slots, I fiddled with cables, I said prayers; nothing changed. Something did change, though, once I put up this review and started getting feedback from my faithful readers. Apparently, this problem's been seen on other Windows machines, without any particular relation to the motherboard or network card being used (an Accton EN1207D, yours delivered for little more than $AU40, in this case). Locking the network card to 100BaseT mode - half or full duplex, depending on the capabilities of the switch or hub - might help, said one reader. He also suggested changing the TCP/IP subnet and seeing if that made a difference. Changing subnet to fix a network problem is sort of like changing your radiator water to fix a squeak in the steering column, but Lord knows changing SCSI addresses randomly has been known to fix bizarre problems with that, so I'm not going to make fun of the idea. But neither was I seized with a burning urge to dig my DHCP server out of the technological totem pole of which it forms the foundation and change the subnet it doles out to the other machines on the LAN. Another couple of readers mentioned that they'd created a problem like this by fooling with their TCP/IP MaxMTU setting, in an attempt to get better performance out of their dial-up Internet connection. Well, that doesn't work, and it didn't apply to this machine anyway, because it had no Dial-Up Adapter, and thus no MTU setting to change. Going back to the fooling-with-the-network-card idea, I tried dropping to 10BaseT mode. And presto, the LAN was accessible at normal speed again. Only normal 10 megabit speed, mind you, but 50 megabytes a minute is good enough. 100BaseT doesn't actually give you ten times the user data throughput of 10BaseT; the difference is substantial, but not nearly as big as you might think. 10BaseT will do. This problem doesn't seem to have anything to do with the A7VL-VM in particular; it's just another bizarre Windows quirk. I'd never seen it before, though. I'll be quite happy if I never see it again. I found what might have been a reference to the slow-LAN problem on A7VL-VMs here, with a link to an updated beta BIOS that was supposed to fix the problem. I downloaded it, I flashed it, it made no difference whatsoever. Nobody who wants to actually use a LAN is going to put up with transfer speeds below the speed of a floppy drive, and dropping to 10BaseT mode is a less-than-perfect solution. But hey, Windows is a less-than-perfect solution too. On a whim, I ran 3DMark 2000. And got a truly shameful result, for a 1GHz Athlon system - a big 796 3DMarks, for the standard 1024 by 768 test. That's not a uselessly slow result; you can actually play 3D games on this thing, if you stick to 640 by 480 or maybe 800 by 600. But compared with pretty much any 3D card on the shelves today, the ProSavage is seriously steenky. My now-dead V770 TNT2 card, for instance, would have trounced it. A TNT2 Model 64 - which is a bit slower than the full TNT2 - scored 1116 3DMarks when I tested it some time ago, using quite old and crusty drivers, on a computer powered by a 500MHz Celeron. That CPU's got little more than a third of the performance of the Athlon on the A7VL. For reference, if you get yourself a high-end Athlon and a GeForce3, you're going to have a hard time scoring less than 8500 in 3DMark 2000. As far as 2D graphics speed goes, though, the ProSavage is fine. If you don't want 3D power, why pay anything for it? There's a lot to be said for little basic boards like the A7VL-VM, if you don't need serious 3D performance. You can get a surprising amount of grunt for serious applications - not just business apps, but heavy-duty Photoshop work and the like - out of a very small box, if you start with an all-in-one Socket A board. Socket A CPUs are very cheap at the moment, and are of course only getting cheaper. There's nothing wrong with a 800MHz Duron, and that's only $AU143, delivered and with a CPU cooler, now. For a workhorse PC, I'd go with one of the cheaper Socket A processors and drop the savings on more RAM. Which, of course, is also alarmingly cheap at the moment. Two Apacer 256Mb PC133 modules to fill the A7VL's two memory slots will only set you back $AU220, delivered, between them, as I write this. That and a half-decent Duron; there's the backbone of a budget Photoshop machine for you. There's no reason to suppose that the network problem I had on my A7VL-VM is characteristic of the board. More than a few of these things have been sold, and every man and his canine companion would be complaining bitterly about it if it were. Maybe the next official BIOS update (there hasn't been one, yet) will cure the problem, anyway. In the meantime, 10BaseT speed's good enough for most people's purposes. Absent bizarre LAN oddities, this is a perfectly good, well-priced little all-in-one. Recommended. Herewith, The Things That You See Dead On This Page.